Vinegar Hill Pottery offer two beautiful Bed and Breakfast rooms and Rosie, a unique gypsy wagon. Vinegar Hill Pottery is unique. It's a small family-owned pottery and bed and breakfast that's very much a family affair. Lucy Rogers oversees the management and day-to-day running of this delightful three-room accommodation (more of that later). Meanwhile husband David is a gifted potter who runs his workshop from the premises and offers tuition to aspiring ceramic artists. 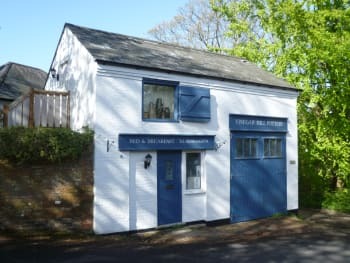 Milford on Sea has a huge amount to offer as we are within easy walking distance to the village centre and the local beaches, within a couple of miles of Keyhaven and Hurst Spit, whilst Lymington and the New Forest are a short drive away. We have plenty of parking. We have a 2 night minimum at weekends but you can try for one night last minute! We have bikes available for guest use. We can offer baby sitting. Talk to us! There are no rooms available at Vinegar Hill Pottery B&B for these dates. This Milford Bed and Breakfast unit is all on the ground floor. The bedroom has a king sized bed, and there is also an option to have two single beds as well. The unit is perfect for families as there is a separate sitting/ dining room to relax in after the kids go to bed. Self contained hideaway with en suite is accessed up an external spiral staircase, so only for able bodied. Breakfast in bed! We deliver your piping hot cooked breakfasts to the door at a pre arranged time. The room is also kitted out with toaster, kettle and cereals. 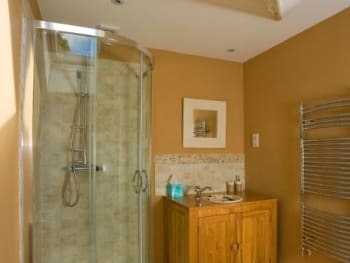 The ensuite bathroom has a fantastic sunflowerhead shower, fluffy towels, a hot towel rail and our range of New Forest Aromatics Toiletries. Rosie is our 1885 Showman's "gypsy" Wagon. She sits outside of the pottery looking over the woodland garden. There is a heated wetroom/shower room a few yards away for Rosie's occupants. Rosie's opulent gypsy chic interior has been lovingly and thoughtfully finished. The supremely comfortable full size double bed. 13.5 tog luxurious duvet topped with a hand stitched vintage lace spread. We had a fantastic stay at the Vinegar Hill Pottery. Everything was absolutely perfect and so well thought out. Would definitely come again. Thanks so much! An old gypsy caravan is what it is so doesn't rate highly in terms of facilities although it was very sweet and we enjoyed staying in it. The wood burner was a Godsend, the breakfast was really lovely and the washing facilities were fine. It might have been a different matter in torrential rain but we were blessed with sunny albeit cold weather and had a ball! Milford on sea is a thriving place with a vibrant centre full of interesting quirky shops and good places to eat. La Perle is to be recommended but book in advance. The Italian was always too busy to accommodate us so book well in advance. Great weekend very well looked after in every aspect. Beach House Hotel was good to eat in. We had a great time staying Rosie - even in the chilly weather! It felt like a real adventure - we would recommend to others. Very friendly, informative hosts and fantastic location! A very friendly welcome from David Rogers on a cold winter's day. The accommodation was very cosy and extremely clean. This was a booking for my son and partner over Christmas as our house was full. The room was bright, airy and clean and my son reported that they both slept really well and liked the room a lot. The B&B was perfect for our short break in the New Forest. The owners were really friendly and helpful. Lots of places to eat within walking distance of B&B. Great coastal walks too. All the amenities of the New Forest just a short drive away. There was limited parking spaces available when we arrived as there was a fully attended pottery class in progress when we arrived. (unfortunately we did not think to book on this, maybe next time!) But the owner moved her car and let us have her space even though we were a few hours earlier than booking in time. Owners were friendly and gave us good recommendations for eating out, many thanks. We tried the Brittania Thai which is a 5 minute walk along the road into Milford. The food was superbly tasty, thanks again for the recommendation. There is also a few tea shops in Milford where we bought some pasties to take for our lunch on our walk around Pennington Marshes. Milford on Sea is thoroughly unique in its restaurants .. we believe. All three places where we ate were fantastic. The Thai and Indian restaurants were outstanding but the best restaurant I think I have ever eaten, and the only one I have eaten at where ALL three, sorry four! courses were absolutely excellent was La Perle, a fab French restaurant and all just a seven minute walk away from VHP! Very comfortable and homely. Great breakfast! The accommodation and the 3-day pottery course were both wonderful. 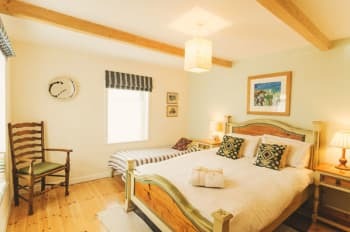 Lovely characterful room, crisp linen, nice touches like the breakfast basket, fresh croissants, tea-making facilities and leaflets on the local area. Really appreciated being able to arrive late evening. One small thing - a tv in the room might be nice for rainy, cold evenings. The village is an easy 5 minutes down the road, a good range of pubs and restaurants. Plenty of space in the Garden Room. Very quiet at night. Made very welcome. Vinegar Hill hard to find. Make sure you have good satnav. Very windy while we were there but wrapped up and explored village and seafront. Looked worth revisiting. We had a great time at Vinegar Hill Pottery B&B. Dave and Lucy were very friendly, the room was great and the breakfast was fantastic. We thought the pottery day was excellent and Dave was a very good and patient teacher - we'd love to come back and stay again! The Indian Restaurant in the town is very friendly and the food was excellent. Also, Mr Pinks Fish & Chips! We loved staying in Rosie! Thank you for a fabulous stay. The pottery course was brilliant also! Great meal at the Thai restaurant in the village. Couldn't recommend your pottery courses enough! Lovely location, we could walk to the beach which had a lovely pizza restaurant for dinner. The pottery day was so much fun, our teacher was knowledgeable and made the experience really enjoyable. Breakfast was delivered to our door at the time we requested, and there was a lovely selection of cereal, fruit, croissants!! Would recommend for sure! Beautiful little wagon- extremely comfortable and had everything you needed. Breakfast was delicious- everything was top quality. Lucy and Dave were kind and helpful and went out of their way to make our stay a delight. Spoilt for choice - a 5 minute walk brings you to a great selection of pubs, cafes and restaurants. Fish and chips on the beach was perfect! Stayed in the Showmans caravan very quaint. Breakfast very good and if on one of the throwing classes the lunches are great too. We had a lovely weekend. Lucy and David are extremely friendly and available for anything. The location is perfect, very quiet at night and very close to everything. Breakfast was superb, Served with fresh produce and Lucy’s homemade marmalade which it was so good we had to ask for more. 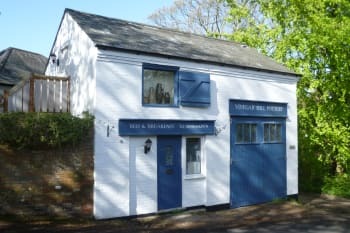 I would recommend to anyone to stay at Vinegar Hill Pottery B&B. Every thing was fabulous, great location, clean and tidy house, helpful owner and very good breakfast. The beach house restaurant was fabulous. Lucy and her husband made the best holiday for us. We enjoyed the beautiful house , the fabulous breakfast and amazing pottery shop. The beach house was one of the best pub restaurants we’ve ever gone , and travelers can visit the amazing Hurst Castle. Wonderful experience staying in such comfortable surroundings while attending the excellent 3-day Vinegar Hill Pottery course. Lovely breakfasts, and friendly welcome from the owners. Great location for seeing the south coast. Friendly owners and excellent pottery throwing course next door. Lucy & David are both super friendly & helpful. The wagon is ace, we loved it. I guess it's not everyone's cup of tea - what with the toilet/ shower facilities being outside etc - but we absolutely loved it. Eat at the Thai restaurant. Eat at Verveine (amazing food there, especially). The Red Lion is a bit sketchy but ok for a quick pint, I spose. Very friendly. Comfortable rooms and good breakfast. Will return. We came for the pottery class which was terrific. Dave and Lucy know all the restaurants but we would recommend Veveine as a special treat. We stayed in the loft room. It was so light and felt very spacious. The bed is comfortable, the shower is lovely and even the toiletries were special - aromatherapy while you wash! Breakfast was delivered to the door at a time agreed the night before - warm croissants, toast, orange juice, fresh fruit and yoghurt. Cereal is already provided in the room along with tea and coffee (even coffee grounds!) - everything you could want except a cafetiere - but I'm sure they'd provide one if you requested it. We had our own. The environment is peaceful. You wouldn't know that pottery classes are going on downstairs. It was worth every penny and I'd definitely return. Go to Hurst on the Hill café for lunch (menu inc. good veggie options) and Britannia Thai for dinner - both in Milford on Sea - a 10 minute walk from Vinegar Hill. 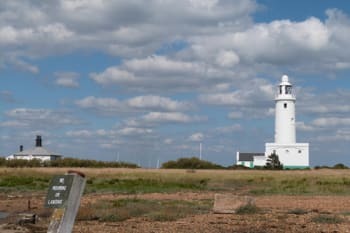 Visit Hurst Castle by walking along the shingle spit from Needles Eye Café (Hurst Road in Milford) and get the ferry back to Keyhaven then walk to Milford Beach. Ferries run every 20 mins March to October. 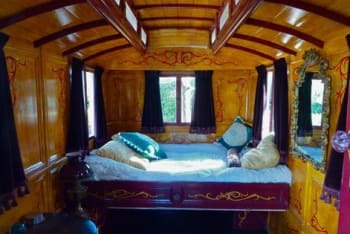 Such a fabulous experience to stay overnight in 'Rosie' the gypsy caravan - beautifully painted and located. Lovingly styled throughout, with a great little heater that was safe, easy to operate and looked the part. Totally private, once inside with curtains and blinds. Still had electricity for phone charging etc but no mention of wifi. It was easy to find the pottery, which stocked some wonderful, unique items and there was ample parking. The facilities are perfectly adequate and clean but if it was raining and you needed to go in the night, it wouldn't be much fun - maybe a comode for emergencies is a thought - although, obviously guests would need to clean it for themselves in the morning, I can see why you wouldn't want to provide it! A couple of hooks to hang coats on might be useful and a little history of the caravan would be a lovely touch. Breakfast was fantastic and brought to your door and the hosts were so friendly and welcoming. A nice stroll down to Milford town and the sea front and some great little bars and restaurants. Can highly recommend and would return again! 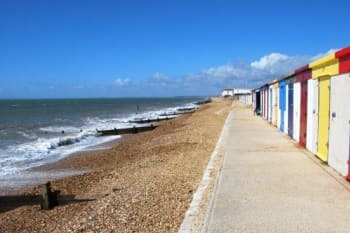 Sea front is 20 mins walk and in Milford town is great bar called The Cave amongst several other restaurants, bars and pubs. Cute little shops and convenience store for emergencies, open till around 8pm. Fab place. The Garden Suite is like having a whole apartment to yourself. Lovely having delicious breakfast brought in at the time of your choice. Very comfy and slept like logs. Do the pottery course with Dave. It's the best therapy ever. Really good fun and he's a great teacher. Eat dinner at La Perle in Milford. Walk along the spit to Hurst Castle. Amazing views out to The Needles. Stayed to partake in the pottery course and see the area. Really friendly couple- very chilled stay. Beautiful surroundings and very tasty continental breakfast. Catered for vegans too. Had a great stay. If I had to make any suggestions at all I would say that the room could support a larger bed but the bed itself was very comfy!! Would def stay again!! WE had a lovely stay thank you, very comfortable. loved the decor and quietness. Also a great location for beach walks etc. Walk to Hurst castle (and get the boat back!) The Beach Hut has good food and try the fish and chips on the green. Sadly as I had to leave so early in the morning, I didn't have the opportunity to have a full breakfast. No opportunity to discover their area. Very welcoming despite pottery course being held. Liked the mugs,plates,jugs,bowls etc used for table. Lovely colours. The garden behind us was used by the couple in the caravan, and later for those on the pottery course. This meant that for privacy we needed to keep the blinds down making sitting room dark. We didn't have a chance to use the garden. Light bulbs good in bedroom. Would recommend to younger travellers. If you are likely to need an evening meal try to book in advance. Both Friday and Saturday evenings were very busy at the places we tried. Parking tricky for inactive. Ended at Gunn Inn Keyhaven on Saturday. Lovely pub, Kitchen closed but we were able to get a sandwich which was most kind and sandwich was good. Red Lion busy, basic pub grub. French Bistro too busy unless booked. Dave and Lucy were great hosts. Very friendly and accommodating. Allowed us to change from Rosie to the Loft room due to illness. Rosie is small but lovingly looked after and has a lovely patio/terrace area. The loft room is beautiful and would be somewhere I could see myself visiting again. Milford is great and is just a quick walk to either the town or the costal walk. The pottery is a lovely place to stay, handy for the sea front as well as the New Forest. The owners are friendly and welcoming and are happy to show you round the pottery if you want to see it. There are some nice restaurants in the town. We tried La Perle - it was very good! Lovely B&B (& loved pottery course too). Only 4 out of 5 for facilities as no TV in Hayloft! But that's a minor quibble and the wifi is excellent. Unusual breakfast arrangement worked very well. Thank you! Fish & chips from Mr Pinks then sat on beach at western end of beach - perfect. Our hosts, David and Lucy, were lovely. And our suite was fantastic: gorgeous, cosy bedroom, large bathroom and - added bonus - our own sitting room and breakfast dining area. It felt more like we had the run of a friend's country pad than a stay at a B&B - and we thoroughly enjoyed it. Don't just stay here - do the pottery course too! It's a must, it really is. So much fun - and you'll be surprised just how much you can achieve in a day. There are several courses in fact. So check them out - David's a great teacher. It's one of the must-do attractions in Milford on Sea. As for food, we ate one delicious plate after the next at La Perle, a restaurant that combines beautifully composed dishes, robust flavours AND large portions. Bliss. We also enjoyed The Cave, which is a popular wine bar that makes a heady Hendrick's G&T, offers a dangerously quaffable Beaujolais and produces very satisfying tapas. WIN WIN WIN. We couldn't get a table at Verveine because its reputation surpasses it and all tables had been nabbed by the time we called. But it's on our list for next time. We really enjoyed our stay and loved having breakfast served in our room, understand that cooked breakfast will not be offered later in the year, that is a shame and would stop us coming again. We had a fantastic stay at the B&B, had a wonderful time on the pottery course and really enjoyed the places Dave pointed out where we should eat at and visit in the local area - 5 stars! Fantastic hosts, they couldn't do enough to help. A beautiful suite of rooms decorated tastefully. A good choice of breakfast. The first place I've ever stayed where there was fresh coffee as a choice on the tea tray, and peppermint tea. Natural good quality soaps and plenty of hot water. The hosts want to make their guests experience natural living in the natural beauty of the New Forest and it's by the seaside what more can you want. If you want a brand new shiny box to sleep in, this isn't the place for you. 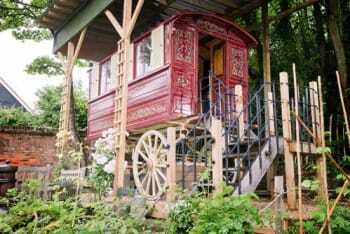 This is rustic charm, with Gypsy Wagon. Don't bother with the Beach House for dinner, go across to Lymington, the Ship is a lovely place to eat. Bucklers Hard with Maritime museum is a nice day out. I rated facilities as 4 out of five because we would have liked to hang up our coats and some clothes but there wasn't a wardrobe. Not a problem really as it was only for two nights. Lucy was friendly and welcoming but we didn't get the chance to speak with Dave the owner as the course was run by his former tutor Colin who gave us a fun and enjoyable day. It would have been interesting to hear of Dave's experience and techniques. 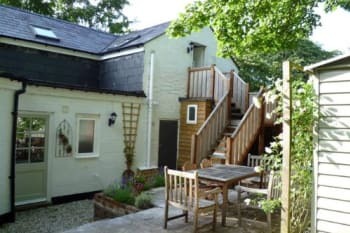 We loved staying at Vinegar Hill - it's a bit different to other B&B's. And we love the pottery ! Friendly and helpful hosts. We loved staying in the Garden Suite - spacious and comfortable. Good range of options for breakfast + proper coffee. Highly recommended! Cycling/running along the seafront and out to Hurst Castle ferry. Visiting Hurst Castle. Excellent food at the Red Lion in Milford-on-Sea. Picnic in the park by the marina in Lymington. Lovely and comfortable, superb breakfast, thank you for making us so welcome. Fabulous cycle ride in the new Forest and then walk along the spit to Henry VIII's castle. It might be worth mentioning there is no tv or radio so people are aware. Not a problem for me but people have come to expect these. I forgot to ask if there was wifi as my phone reception was patchy. Lovely towels - can't stand skimpy towels! A beautiful, peaceful spot. Came for the pottery course so would recommend that highly, a great day. Just a stone's throw from the beach, nestled in beautiful countryside, a peaceful and very comfortable retreat. Delicious breakfasts and the privacy of our own dining/living area. A walk along the beach and a G&T at the 'Cave' in the village. Fantastic stay, booked last minute as hotels in the surrounding area were overpriced or not as inviting as the pottery. A home form home stay for us, super breakfast and plenty of space. To quote my girlfriend on the journey home, "This weekend is my favourite weekend we've had away together". Starting with an incredibly warm welcome, recommendations of where to go locally and extremely comfortable beds, we woke up to a superbly cooked breakfast with locally sourced ingredients. The group size was perfect, enough people to have a laugh with over the lunchtime feast, yet small enough that we were given time and attention to develop our skills. We had grins on our faces for the whole week afterwards and felt so lucky to have had the chance to experience a full weekend at such a hidden gem of a place. Thank you for your hospitality and general awesomeness, we have been strongly considering coming back later in the year as it was that good! There are options to suit most budgets and preferences just a short walk or car ride away. Less than a 10 minute stroll into town, we were able to have a pub dinner and drinks at the Red Lion, with a live band playing the likes of Smoke on the Water and other classics. The staff, prices and portion sizes were great with the added bonus of neither of us needing to drive. The Thai restaurant across the road was pretty quiet for a Saturday and tasted incredible, but if we went back we would probably try out Verveine (Fish Restaurant) as absolutely everyone we met said it was the best place around (advised to book ahead). Activity-wise, the Pottery course was unbelievably awesome, both my girlfriend and I were grinning for days afterwards and the feast they provided was delicious. The beach is not far, a nice walk/jog along the cliffs, great for dog walking too. We didn't feel the need to have an action packed weekend here at all and got the impression that everyone was pretty content with their town/way of life. The owners can also recommend things to do and see, as well as there being a board in the room with recommendations from previous guests. Just the loveliest place to stay. Everything was perfect and I can't think of anything that would have made it better. Sorry for our tardy departure time. If you want to go to La Perle restaurant book in advance as it is tiny. Thai place is nice and probably doesn't require booking. Riding a bike to Lymington and ferry to Isle of Wight is really nice, but maybe wait for warmer weather, total distance around island is 65miles (so 75 total), shorter routes are available. A really lovely spot near to the local town and the beach with great views of the IOW. Clean and very comfy accommodation. Everything just right; lovely breakfast and very friendly. I also enjoyed a one day pottery course on site. Would highly recommend. A breath of fresh air. We ate locally at La Perle and Verveine. Would highly recommend both. Be sure to sample the nostalgic 'sherbet fountain' at the latter. Also make time for a coffee at the Needles eye cafe and a stroll along the spit to Hurst castle. Very friendly and helpful. Only reason for facilities = 4 is that its not possible to hold the velux window blinds down using the stick, can this be fixed? Also at payment time, we were told the price would have a surcharge if we used credit rather than debit card. this either needs making clear/clearer up front, or allow the credit card fee to be absorbed in your costs. Lovely laid back stay. Absolutely beautiful place - each and every room! Brilliant place to stay. Liked the informal relaxed environment but with everything professionally done. Not always easy to get this right but you have here at VHP B&B with flying colours. Beautifully decorated suite, that felt more like a cottage than a B&B. Lovely to have the breakfast served in our own living/dining room. Will definitely be staying again next time we go to New Forest. We enjoyed a family meal at The Beach House in Milford, and the sandy beach at Avon (10 to 15 minutes from Milford). The friendliest, most simplist (in a good way) stay! Rose the caravan was a delight and the surrounding greenery was beautiful in the morning. Very helpful staff with good knowledge of where to go all over Hampshire etc. thanks once again! Fabulous tuition from Dave. He had endless patience and went out of his way to make us all feel welcome. Food was amazing both at coffee breaks and lunches. Very comfortable accommodation with delicious breakfasts. Would thoroughly recommend. Made welcome from arrival till departure.... Excellent Would definitely recommend to friends. The Thai restaurant in town was lovely.if you enjoy walking take the time to explore the local area, Hurst Spit worth a visit. Great alternative idea with very friendly owners. The Smugglers Inn and walks around the harbour area. Fantastic place to stay for an unusual break. Local Thai restaurant was fantastic. Staying in 'Rosie the Gypsy Caravan' was such a unique experience. It was very cosy and facilities, even though outside were clean and well kept. We were met by a friendly face who engaged with us and recommended lots of great places to visit on top of what we had already planned. The breakfast was tasty too. All in all a very great stay in a beautiful location. My husband had a wonderful birthday surprise so our trip was a success and Vinegar Hill definitely contributed to this. I would recommend to anyone who is up for staying somewhere a little different! Take a walk around the Nature Reserve only up the road. Drive down to the port where you can catch a small boat across to Hurst Castle. After visiting the castle you can take a lovely stroll back around 2 miles to your car, along the shore. Definitely visit the Raft Rocks for dinner down the seafront. Absolutely wonderful place, fantastic food and lovely atmosphere! fantastic break. everything we had hoped for. great blend of the pottery course and being able to have a break away from the kids for a few days. Thank you and Dave for your great hospitality and also Mikky (I think??) for her wonderful cooking at lunchtime. Amazing experience. Booked Garden suite which I loved and went on the pottery course. It's so challenging you forget about everything else and meet very nice people. Dave is a great teacher, everyone took home lots of Raku pots and very practical items they' d made. Breakfast is home cooked and delivered hot to your accommodation, lunch is absolutely delicious served communally al fresco or in the gallery showcasing the full range that you can buy or make. Thanks Lucy and Dave for the hospitality and the Raku course. It's really been a great time. 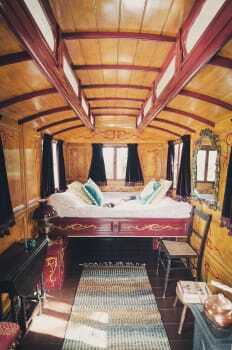 I love Rosie the gypsy wagon a lot, with the nice decorations, colour, the smell of wood and the "fire place". The Raku course is extremely well structured. Dave delivered the course very well and make things live and more interesting. Seeing my Raku pots on fire gave me great fun. I can't forget to mention the wonderfully delicious meals you provided. It's really more than perfect. If I really need to pick something to comment negatively, it would be the shower room a bit too dark (but that wasn't much a problem). I recommend The Village Coffee Pot. Apart from the nice food they provide, I think they are one of the few café nowadays would care about how to make proper tea. The Hurst Castle would be the must-see I think. It's really spectacular. We had an excellent weekend with yourselves. Our room was lovely and the course fantastic! I have already sung your praises to lots of people. La Perle in town was very good. We would have gone to Raft Rocks on the beach front but it was fully booked. The menu & restaurant looked great. We were made to feel very welcome during our stay in the garden room. Nothing was too much trouble and we were extremely well looked after with delicious breakfasts, lunches and cakes. The course was well organised and with Dave's great tutoring skills we all managed to produce some works of art. I particularly enjoyed the raku process. It was all great fun. We had a couple of lovely meals at Raft, a very relaxed bistro just a short stroll from the pottery. Had a lovely time. Hospitality was spot on not overly fussy or heavy handed but everything there when. You eldest. Just right. One small tip..... An extra storage space outside Rosie for whenever bikers are present would be super helpful. The restaurant Verveine is mentioned as a 'go to' place. We found it expensive and ok but nothing more. The local pub food was much better. Dave & Lucy are charming hosts, they make you very welcome and nothing is too much trouble. A word to the wise though, the two rooms indoors are really nice but be warned, "Rosie" the showman's caravan is only for the most adventurous of guests and quite an ordeal for the more mature resident..... The pottery course was action packed and fun. Dave is an excellent teacher and it was pitched brilliantly for us all as beginners. Lymington for shopping and a walk. Verveine and La Perle restaurants very nice in the village. Lucy and Dave were excellent hosts. Very accommodating and friendly. The food was perfection - always! They both put themselves out to ensure every need was met - nothing was too much trouble. They are lovely people. Comfortable, homely accommodation and great breakfasts made our stay a calm, relaxing experience. It was just the break we needed to unwind. It's very easy to get to Beaulieu and Bournemouth from here. The walk along the shingle beach to Hurst Castle is bracing but worthwhile. We recommend the Thai restaurant but the friendliest place to eat was definitely The Raft. The fish and chips shop on the village green was also worth a visit. The lady in the Post Office spent half an hour teaching our daughter to knit! Just one of the friendly people we met during our stay. A truly wonderful stay! Accommodation was first class , clean and very comfortable. The Garden room had TV, and WiFi. The food was excellent and very generous portions so much so that we didn't eat out in the evenings. Dave and Lucy are very friendly and make you feel very welcome. Hi there thanks for your review - we do take it on board regarding the door slamming and will need to think about that! Re the coffee in the morning - there is a cafetiere and tea pot in the window and fresh coffee in the jar on the tray. Sorry that you missed that - I will try and point it out in future. It was great to accommodate you. Loved the whole thing and would certainly return to stay. Bit weird that there is no lock on the main room door of garden suite, and not 100% happy with having one visit in morning to lay table (Although quite nice this is done) then another to bring in breakfast (which was lush), then another to bring toast.. could this not all be done at once? I loved the loft restaurant. Outstanding weekend, Milford was in walking distance with all the facilities you could need and the walk to Lymington along the coast was stunning. Lucy, David and their family were delightful hosts. We were made welcome and all of our needs were met. Dave sorted a good breakfast each morning to suit our needs. They have an excellent knowledge of the local area and clearly they enjoyed managing a very good bed and breakfast. we felt we got value for money. Dave's pottery is innovative. The studio is worth a visit just to see his speciality glazed bathroom sink. We had an evening meal at La Perle, which provided a first class meal. We had lobster and hake, both of which were beautifully prepared and presented, with real fresh cooked chips. We had another meal at the Noisy Lobster in Mudeford. It is a beach side cafe/restaurant with a beautiful view of Christchurch Bay. The service was excellent, and the food very good and well worth the journey. Lovely B&b. Room very comfortable and clean. Just needs somewhere to hang things! Local village has plenty of good eateries and pubs for inexpensive meals. The Smugglers was excellent for food with friendly and efficient staff. We stayed because we were attending the pottery class but would stay again if visiting the location. Village was a short walk away (10 mins or less) Really enjoyed La Perl in the village for dinner. Great food based on local produce and knowledgeable front of house who just did everything spot on. We'll be heading back just for the food one night soon. The Hayloft was lovely and cosy. All requirements met except the Wi-Fi connection. The breakfast delivered on time piping hot and delicious. Location central to amenities. Loved Smugglers Inn. The shore walk was amazing along the cliffs. Thank you. Do book and enjoy a lovely welcome/stay/location. An unusual B&B which we really enjoyed. Loved the way breakfast worked too. And we loved the pottery ! You've done a great job with the place! We really enjoyed our stay. A wonderful stay at Vinegar Hill - so peaceful and relaxing. Great service and local knowledge. Most of all, we loved having breakfast delivered in the morning! Note that there isn't a TV in the room - it meant we actually talked to each other for once! Lucy & Dave recommended Verveine,local restaurant and it was superb. 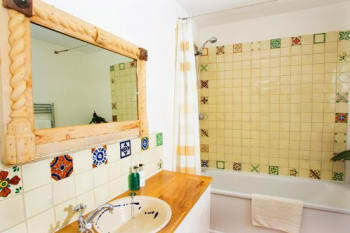 We had a lovely time in the gypsy caravan,thankfully the weather was kind to us.There is only one small detail which we thought would be a good idea to have,and that's a mirror in the shower room,only it would make life easier when shaving etc. Otherwise great,the breakfast was fab. A great location,lots of choice for eating places,and only a short walk away. We found a warm welcome when we arrived and you catered very well to our needs. Your local knowledge was also invaluable. The Pottery added another dimension to our visit. It was great that we were able to enjoy the fruits of you labour at breakfast. We enjoyed our visit to the The Cave in Milford on Sea on the Sunday. Such a shame that so few of the local eateries opened on a Monday. Regrettably our visit was too short to take in any of the other delights the area had to offer. The beach house is a good place to eat. You can walk from Keyhaven or milford on sea to Hurst castle, in about 40 mins. Dave and Lucy Rogers and their family were delightful. The bedroom and shower room in the Hayloft were clean and very comfortable. Home-made bread for breakfast was a real treat. Mr. Pink's Fish and Chips - not to be missed! Amazing property and surroundings. Lovely inside and out. Great breakfast. Nothing too much trouble. Comfy beds. Can't fault it at all. Had a lovely break here and would like to return in the future. 5 minute walk to village. Tried Smuggler's Inn (nice pub food). Mr Pinks Fish and Chips Shop is great for takeaway food. Get to village early for evening meal as gets quite busy. If you like walking try the Hurst Castle walk along the spit. Around 2 miles to castle. There is a ferry if you don't want them walk. Just over bridge at caravan site. Good afternoon spent there. Beautifully maintained caravan well placed for trips in the New Forest. Excellent breakfast and a very novel experience. Most restaurants in Milford on Sea are closed on a Monday. We had a nice pub meal but don't expect much more! Definitely visit Mottisfont Abbey (don't miss the walled garden) and do the "Tower Tour" at Salisbury Cathedral. We had a great pizza at "The Raft" in Milford. We had a really nice stay at this B&B. Very quiet, nice living room, good breakfast. The walk to Hurst Castle is very nice, even on a windy and rainy day. Great location, friendly owners, the Garden Suite is large. Easy to walk into the village, we ate at the Smuggler's Inn where the staff couldn't have been more welcoming and helpful! It was a lovely setting. I was in the gypsy caravan overlooking the garden with my daughter. My husband and son slept in the house where there was a spacious breakfast room and good bathroom. The breakfast was delicious and it was interesting visiting the pottery. The hosts were very friendly and helpful. There were several good restaurants a walk away in the town. We ate in the Indian which was great value (we took away enough for dinner the next night!). We really enjoyed walking one way and ferrying the other to see Hurst Castle from nearby. The Hayloft is a good spot and with access by an exterior spiral staircase compact luggage is easier to handle. Super friendly and very comfortable accommodation. Very cute and quirky set up behind the Pottery. Breakfast is delicious. Only negative is the thin ceiling so you can hear the upstairs guests but it doesn't spoil the stay. Milford on Sea great as an easy walk, lovely places to eat and good selection. Fabulous location. Very helpful and friendly...accommodated my son happily. Would definitely stay again. This was a really lovely stay. A friendly , relaxed and helpful welcome, peaceful and spacious room and generous and tasty breakfast. All very restful. Lovely woodland walks : a short one by a stream to the village one way and through a nature reserve and heathland to the beach the other way. We enjoyed a fun night in The Cave , a splendid lunch in La Perle. The architecture, garden and beer at The Beach House are all very fine. Friendly and relaxing atmosphere, lots of space in the garden room. Lovely to have your breakfast brought to you in your private dining room so you could relax in our dressing gowns ! Bed very comfortable and shower powerful. local beach very pleasant and only a short stroll away. Walk to Barton on Sea along the cliff top, about three miles each way, fab ! Britannia Thai just up on the village green a good place to eat, booking advisable at the weekend. A very warm welcome; very friendly and helpful. Interested in us. The arrangements were explained fully and we really enjoyed our stay in Rosie. We admired your creativity of fitting the washroom under the stairs! Your pottery is beautiful - if we ever do a washroom we would love one of your basins. If you don't have long to look at the sea, you can park for free for an hour in the road leading to Sturt Pond by the sea front car park. We had a lovely stay in Rosie. It was very cozy and warm even when chilly outside. It was decorated very nicely and had pretty much everything you might need. I was nervous about the small wet room at first, but it was absolutely fine. The location was great - really close walking distance from the village green with all the restaurants and also from the sea! Also, only an £11 taxi from Lymington. It would be great if there could be another water jug out there. By the time you make tea and coffee, there is no water left to drink. It would also be good if the wi-fi router was closer to Rosie. Unfortunately it's sometimes necessary to reply to some work emails over the weekend and that proved to be difficult due to lack of connection (some people may actually find this a positive!). The Beach House had amazing views and was a short walk away (food wasn't amazing). The little area around the village green was really lovely and quaint. We had an very enjoyable stay and Dave and Lucy made us very welcome. It was nice to be part of a family home. Excellent choice of places to eat within walking distance. Lovely area both coastal and inland in the New Forest. Very comfortable stay,excellent breakfast served on hand crafted plates and bowls from the pottery - nice touches. Be aware of the spiral staircase up to the loft and unusually these days, no TV. Great experience and really enjoyable. We'd never stayed in anything like this before (Rosie, the vintage gypsy caravan) and really took to the whole thing, the decor, the set up and the place. The weather certainly helped but you made us feel very welcome and have a great manner and way with your guests. Would certainly recommend a weekend break to anyone looking to stay somewhere a bit different. Milford on sea is charming and an easy ten minute walk away - lots of good places to eat and drink as well as a nice selection of independent shops. The Saturday market in Lymington was also great fun - but get off early to miss traffic! A perfect stay! Good location for getting around. We had a little one so we chose this as we were able to sit in the our own lounge once we returned from a lovely meal and coastal walk at the Beach House and put the little one to bed in the next room. Breakfast was served in the lounge too so very relaxing and no rushing around with the little one trying to get ready. The courtyard we had access too is a little sun trap! Beach House for dinner was fab with a lovely coastal walk afterwards! A few minutes drive to take the little ferry boat across to the Hurst castle. We also visited the Isle of Wight & Burley. There is plenty around within easy driving to see and do! We enjoyed our stay and would visit again. The village centre and restaurants/pubs are within walking distance. We would recommend the Thai restaurant. Beaulieu nearby is also worth a visit. A perfect place to stay for a weekend break. 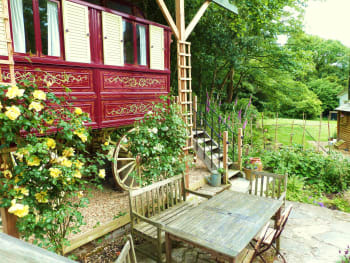 Rosie the Gypsy Wagon was lovely, breakfasts were great and the surrounding area just right. Thank you. Really lovely venue for a relaxed weekend with friends. The pottery course was excellent, the food was fantastic, the owners & staff were incredibly friendly & helpful. Beautiful village setting close to the coast & within easy access of Lymington & the New Forest. A short walk to the village centre where we enjoyed the Thai restaurant one evening & The Cave for drinks & snacks another evening. Quirky and different. A lovely stay and thoroughly enjoyed. A few of the places mentioned for dinner were only open from Wednesday -Saturday. It's a beautiful house and the rooms are lovely furnished. Its not only one room its a flat, so you have a huge private area and if you wish you are welcome to the very friendly owners, look around the pottery and they help you to have a very pleasant stay. WE were very happy to find this exceptionally nice place in a lovely area. Beach and restaurants within Walking distance. Thank you for the warm welcome. In Walking distance many restaurants, WE tried the indian: friendly and good food. The New Forest is nearby. Nice beach and beautiful views in Milford Bournemouth with sandy beach Not to far also very nice the area of Studland ( with car Ferry from Poole) Lymington high street and yacht Port is beautiful. The Britannia Thai restaurant is excellent, friendly staff . Very convenient for town, walking on beach and for pottery course! Very helpful staff place was excellent for four friends who needed to get away. Thank you. Maybe avoid the Smugglers Inn for food unless you are after standard pub grub. Had burgers and you could have bounced them off the floor, good atmosphere though and good beer. An absolutely unique experience in the most fantastic gypsy Wagon. Facilities are basic (as you would expect) but a truly wonderful place to stay. Milford on Sea is a foodie heaven. Brilliant Thai, great pubs; excellent fish restaurant and the best view for lunch from The Beach House. We've just got back from a one night stay in the Garden Suite at Vinegar Hill Pottery B&B it was great thank you Lucy and Dave. A perfect spot for wandering into Milford for walks and dinner. Highly recommended! Fantastic apartment, gorgeous location, lovely people!! A lovely, friendly family place. 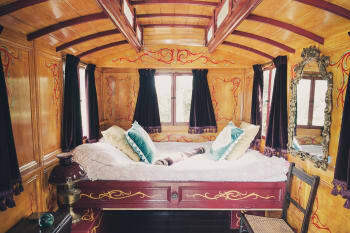 We loved our stay in Rosie the Gypsy Caravan - it was perfectly quirky and cosy. Although David and Lucy went away on the Saturday morning, we were looked after brilliantly by their 'substitute' (really sorry, but your name escapes us) for the remainder of our stay. We were made to feel extremely welcome and were even given a congratulations gift to celebrate our recent marriage. Rosie is small, so guests need to take that into account. We loved the experience, but it's important for people to realise that there really isn't a lot of room to manoeuvre in there; for instance, as it was wet on Sunday morning, we had to eat our breakfast inside the caravan, rather than outside in the garden - this made for a somewhat cosy (or cramped) experience but we didn't mind as we had looked closely at the website. Overall, we loved our stay. It's a friendly, welcoming place with a relaxed atmosphere, and the opportunity to stay in a piece of history is one not to be missed. The breakfasts were delicious and having them delivered to the caravan was a real treat! One or two things we would like to mention are as follows: 1. On the Saturday, we had to share what we thought were our private bathroom facilities with a group of people booked on a pottery course. We found that slightly disappointing as we believed we were paying for our own 'wet room'. Nevertheless, it wasn't a major problem. 2. There is no way of getting towels dry after a shower. There isn't anywhere to hang them in the wet room - it really is a cupboard under the stairs (hence the 3 for facilities) - and there's no chance of them drying in the caravan when it's damp and a little chilly outside (plus, there's not really anywhere to hang them inside Rosie). It's just a little niggle but something to consider, perhaps. The Raft is a brilliant restaurant in Milford. Can't recommend it highly enough. We also enjoyed the Britannia Thai which was really busy, even on a Sunday evening. Lovely place and lovely people running it. Would definitely return. I guess my only issue is the bed. I'm 6 foot 5 and a double is slightly to small for me, but I don't think there's room for a bigger bed. The use of the bikes was excellent. So many lovely restaurants to choose from - a lovely bonus. Really friendly, great space, brilliant breakfasts! The smugglers pub does great food in the town. Pie or sausage and mash is a great bet. Good range of restaurants etc in local area. Near the coast-we enjoyed visiting both Lymington and Key Haven and of course on the edge of the Forest. Lucy and Dave were both fantastic and made us feel extremely welcome. The garden suite was beautiful and comfortable, it felt like everything we could possibly want and need was already available in the room. We went for dinner at Verveine and had the 6 course taster menu, it was incredible! We would also recommend a visit to Beaulieu, where there is a great bar/restaurant and a chocolate studio around the corner! We walked from Beaulieu to Bucklers Hard, it was a beautiful walk and there is a great bar/restaurant at the other end. thank you so much, we had a wondeful weekend - a lovely peaceful retreat. the cave - wine bar Verveine - fish resturant (friendly and brilliant) VH pottery course - also brilliant! Beautiful, tranquil place. Lovely people. Fantastic breakfast. Easy walking distance to village. French Restaurant, La Perla is a must if you enjoy good food & wine. Not cheap but you get what you pay for. The Smugglers Inn - home cooked good food very reasonably priced. Very friendly and helpful. Nice room (Hayloft). Good location within 5 minute walk of the village and a short walk to the beach. Some nice places to eat in the village. Hurst Castle is a reasnoble distance if walking so drive if you have younger children. The walk along the spit was gorgeous and the castle kept 2 little boys entertained for hours. Recomned the boat ride back and the pub at Keyhaven for lunch. We only stayed a few nights however Lucy & Dave made us feel really welcome and nothing was a problem for them. Our only suggestion would be for a bell on the main door into the garden suite to pre-warn visitors of someone coming into the room. If we are in this area again we would love to stay here as felt relaxing - even with a 6 week old baby!! We went for an evening meal at the Smugglers Inn which is in the village. Don't be put off by the exterior as the food and service was excellent and they had a good childrens menu. If visiting Christchurch, there is a child friendly cafe by the church called Cheese & Alfies where the service was really friendly and had books/toys to keep children amused whilst you have your coffee. Friendly and welcoming place to stay, we loved the Gypsy Caravan - it was amazing. Great breakfast just to top it off - Thank you! We walked into the village which was only 5 minutes away, lots of restaurants to choose from. We chose the Smugglers Inn which was lovely. Would recommend both the accommodation and the village for a get-away. A lovely warm welcome, great breakfast and a separate lounge so that we could relax once our son had gone to sleep! Thank you for a great stay and for being great hosts. Very nice place to stay - had a lovely relaxing weekend. Absolutely delightful; charming accommodation; friendly family situation. What a lovely place to stay! 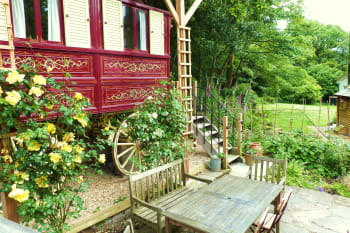 Unfortunately, the weather was horrid but our stay in the garden suite was still lovely as it looked out into a little courtyard with a beautiful gypsy caravan. 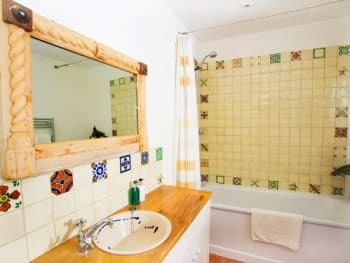 The accommodation was really clean, very cosy and tastefully decorated with lots of little personal touches like the handmade pots and crockery from the pottery. Clare was our host as the owners were on holiday but she was so helpful... She even took our daughter out in the mornings to fetch eggs for our breakfast from the resident chickens! What I really loved about the garden suite is that it had a separate private lounge so that we could sit in there and watch TV once my daughter had gone to bed. And the large bathroom was also a bonus... It was lovely to be able to choose between a bath or shower (so many b&b's have cramped shower cubicles only). We will definitely be back. As the weather was poor we had to venture further afield. We visited Portsmouth's Historic Dockyards which is a great family day out. Locally, the Indian restaurant Rivaaz is great. We were disappointed that there was no hanging space for our clothes. I found a nail on the wall where I hung my coat. We felt that we should be shown the facilities of the room in view of the unusual nature of receiving a cold box etc for breakfast. We had to ask how your system worked as regards breakfast. Despite your information note saying that the cold box would be given to us "early evening" it arrived in the morning and we therefore only "found" it outside our door at 8.30 in the morning when it was too late to eat our cereal. The lady who looked after us was very pleasant and friendly. Really warm welcome, brilliant stay in the gypsy caravan. Good full english breakfast. Owners recommended Vervaine (Fish restaurant) which was excellent. Brilliant walks along the beachfront. We stayed in Rosie, the gypsy caravan, and had a super stay. Dave and Lucy have thought of everything and the breakfast was delicious! We will certainly return....! Dinner at The Raft was excellent. Had a lovely stay in this B&B. I stayed in the hayloft room with my boyfriend and my parents stayed in the gypsy caravan. The room has all the amenities that you need and some nice touches e.g. cookies. At breakfast we had a choice of a full English or vegetarian delivered to the room. I thought breakfast was fine but the rest of my travel companions did not enjoy it at all. The host was very friendly but maybe popped up to our room a few too many times in the morning. All in all, I enjoyed the stay here. Had an amazing dinner in Egan's Restaurant, Lymington. Very reasonably priced for the food on offer. 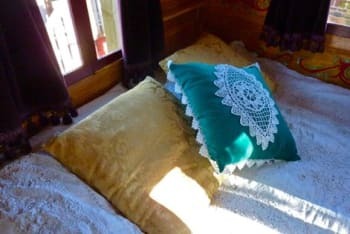 Our brief stay in "Rosie", the gypsy caravan, was an absolutely delightful break. Despite the hot weather (and some initial doubts on my part about feeling a bit claustrophobic), because of the secluded spot we were able to have all the windows open and this kept things nice and airy. Thank you to Lucy and family for a discrete welcome and well judged service. Take the ferry to Hurst castle - cheery ferryman and a pleasant trip out there if you're not feeling up to the worthy trudge along the spit! Monday nights - food isn't served after 9 in the pubs and the Red Lion seemed to be impossible to get into on the Sunday and Monday evenings for some reason. Check out the Village Antique Shop for an eclectic selection, friendly service (and "deals" if you don't mind haggling). Comfortable and quiet with nice touches unusual in a B&B like a private breakfast in your own room. We stayed on a very warm evening and the loft suite could have benefitted from an electric fan but the Velux windows did give us a great view of a spectacular storm whist lying in bed! Very welcoming and friendly. Delicious breakfast. Great local restaurants La Perle, Verveine. Also The Cave nice for a drink. Very good - excellent B&B, breakfast and hosts. We've only marked down the facilities because of a few niggles - such as the 10.5 tog duvet provided being too heavy for the summer (in our view), and the bathroom door handle was loose (constantly afraid that I'd pull it off!) and the door wouldn't stay closed unless bolted; the lower shower fitting seemed loose/broken. But all only niggles really - would certainly stay again! Some of the restaurants in Milford don't open Sunday and/or Monday and/or Tuesday, and the restaurant that we booked into for the Tuesday night - La Perle - unfortunately then had to close because of staff illness. We ended up eating twice at The Raft - which was very good - and once buying a picnic at the Co-op. Room suite very comfortable & homely, breakfast & service excellent. La Perle restaurant (In Milford) is amazing! Food out of this world and service second to none. Friendly welcome and excellent service throughout the stay. La Perle restaurant is excellent and The Cave is good for a drink either before or after dinner. The Hayloft is a complete haven. At night the owls send you to sleep, by dawn the trees are dappling the room with leaf patterns and the blackbirds and wood pigeons are making their mark on the day. And then it is not long until breakfast. In your room up away from things, leisurely, leisurely. Old fashioned bangers and fresh eggs. I can't remember feeling so content and calm. Thanks to Lucy and David. The Verveine - wonderfully imaginative fish dishes and charming informed staff. The nice chap who takes you across on the ferry to Hurst Castle, knows every swan and eider duck on his patch. The lovely local church. Lanes and wildflowers from the front door. We love Vinegar Hill, it's quirky and stylish but still has everything you'd need/expect and a bit more! Breakfast in bed is a luxury and the owners are incredibly friendly, helpful and welcoming. The wonderful touch of having Dave's own pottery around (plates, mugs, even the basin!) is a joy - next time I'm hoping we will do a pottery course too! Milford is lovely just to wander around. You must visit Hurst Castle! We've had good fish & chips from Mister Pinks, a lovely relaxed meal at the Raft (delicious fish soup!) and a very swish meal at the Marine (which we found to be a bit style over substance but good service). We had a fantastic stay here. The owners are lovely, our room comfortable and quiet and the cooked breakfast delicious. Beautiful place. Very good for a family of 4. We enjoyed a wonderful break at Vinegar Hill. The garden room was ideal for our family of four. Dave and Lucy were very kind and helpful. Breakfast was lovely with a homely feel. We look forward to returning for one of their pottery courses. Really nice place, a couple of things that my wife picked up on. No wardrobe space in The Hayloft. Overnight cool box doesn't work effectively, best do it in the morning. Needs a tv especially if the weather's bad. Nonetheless a super place to stay. We had a lovely stay in the Wagon. Everything provided and the hosts could not have been more helpful. Great location as you are within walking distance of the village where all the restaurants / shops etc are. Dave & Lucy are able to share all local knowledge for anything specific you need. Very relaxing, very friendly, will come back for the pottery course! We really enjoyed our stay in the garden room. It was fantastic having the living room space. Dave was very helpful with tips about where to go and breakfast was delicious. Vervaine was pricey but delicious and an experience! The Cave is good for wine tasting. Raft has delicious pizza. Visit Hurst Castle! We were fortunate to stay in the Garden Suite, which was very spacious and comfortable, with tasteful decor and furnishings. David and Lucy are excellent hosts and produced superb breakfasts. David produces lovely pottery, some of which is now adorning our home. We thoroughly enjoyed our stay in the Hayloft. Just a small point, a few hooks to hang our clothes on would be nice, as no wardrobe especially if staying a longer period. A torch at night and a visit to the gardens down the road is well worth it, wellies if wet but the paths are laid out. Excellent! So many eateries, spoilt for choice.